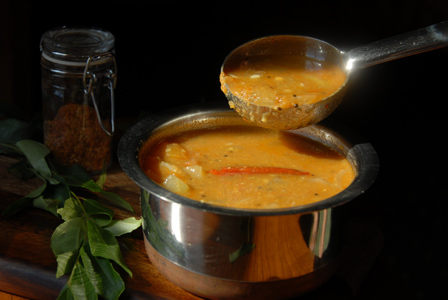 Makes: around 3 Cups of Madras Sambar. Peel and chop the onion into big chunks. Soak tamarind in quarter cup of warm water for sometime and extract all the juice discarding the veins. Grind ginger and garlic into paste. Alternatively, grate both ginger and garlic and keep aside. 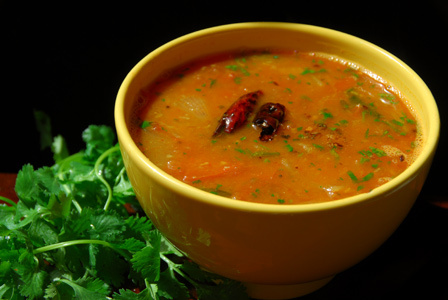 Alternatively, boil toor dal in around cup and half of water for around 40 minutes for it to soften. Mash the dal with a masher and keep aside. Heat a tsp of oil in a sauce pot, add chopped onion. Fry till onion starts to change color. Stir in ginger garlic paste and fry till the raw smell of the paste disappears and the onions turn golden brown. Heat a sauce pot on medium heat, add chopped tomato, tamarind extract, a cup of water, turmeric and salt. Boil till the tomatoes turn extremely soft but not mushy. Now add the fried onion to the pot along with mashed dal and around a cup of water. Mix well and stir in sambar powder, turmeric powder, red chili powder, sugar and salt. Bring to boil and let the sambar bubble for couple of minutes. When mustard seeds start spluttering and urad dal changes color, remove from heat and add to the sambar. Notes: Make sure not to overcook any of the ingredients. Suggestions: Adjust the consistency of the sambar with water. Variations: You can also fry the onions and tomatoes in same pot but the texture varies. Also other vegetables like lady’s finger, bottle gourd can be added. Chop up the fresh coconut and grind it along with coriander seeds, red chile powder and a cup of water. Squeeze the ground coconut mixture to extract all the milk. Grind squeezed coconut with another cup of water and squeeze again to obtain more coconut milk. Repeat until the extract is thick and white in color. Soak tamarind in half a cup of water and extract the juice out of it. Pressure cook toor dal in a cup of water for 2-3 whistles. Heat oil in a vessel, add all talimpu ingredients in order. When seeds start spluttering, add green chiles, onion and stir fry. Once onion turns translucent, add tomato, tamarind extract, turmeric powder and salt. When tomato turns soft, add coconut milk and cooked toor dal. Remove from heat once it comes to a slight bubble. 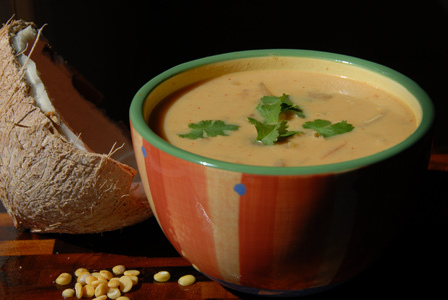 Notes: Use fresh coconut milk to make this sambar. Remove stems, wash and slit green chillies. Peel and chop bottle gourd into small cubes. Wash and chop 4 of the tomatoes into cubes. Grind one tomato(coarsely chopped) into smooth paste using water if required. Peel, cut in half and slice the onion. Soak the tamarind in 1 cup of water and extract the pulp. Wash and cook the dal in 2 1/4 cups of water for 3 whistles using pressure cooker. Mash the cooked dal roughly and keep aside. Finely grind the masala ingredients into fine powder using a blender. Heat oil in a deep vessel, add all talimpu ingredients in order. Then add tamarind pulp, chopped bottle gourd, onion, tomatoes, green chillies, turmeric powder, salt and 2-3 cups of water. Cook covered until all the vegetables are almost cooked. Leave a little crunch to the vegetables. Add ground masala powder, mashed dal, pureed tomato and water (to attain required consistency). Let it bubble on medium-low flame for 10-15 minutes. Notes: You can also grind few tbsps of grated coconut along with tomato and add to sambar.